FLINT, Mich. — General Motors is adding size, power and options to the redesigned 2020 Silverado HD pickup. The vehicles, when they arrive in showrooms midyear, will be available in five trim levels — Work Truck, Custom, LT, LTZ and High Country — across 22 cab, bed, chassis and driveline configurations. They, like their GMC Sierra HD siblings, will be available with two new powertrains. The standard engine is a new 6.6-liter gasoline V-8 with direct injection making 401 hp and 464 pound-feet of torque mated to a six-speed automatic transmission. That's an 11 percent increase in horsepower and a 22 percent increase in peak torque, respectively, resulting in 18 percent more towing capability —17,400 pounds — according to GM. It replaces a 6.0-liter gasoline V-8 that delivered 360 hp and 380 pound-feet of torque. The optional engine is a 6.6-liter diesel V-8 rated at 445 hp and 910 pound-feet of torque coupled with a 10-speed automatic transmission co-developed with Allison. The diesel model, combined with additional upgrades, boosts max towing 52 percent — now up to 35,500 pounds on Regular Cab, two-wheel drive, dually rear-wheel models. The Duramax diesel engine will be built at its jointly operated DMAX facility in Moraine, Ohio. The 10-speed transmission will be produced at GM’s Toledo Transmission plant in Ohio. The 6.6-liter gas engine and six-speed transmission will be produced at the automaker’s Tonawanda Engine plant in Buffalo, N.Y. The company declined to say how many, if any, new jobs are expected to be created from the work. 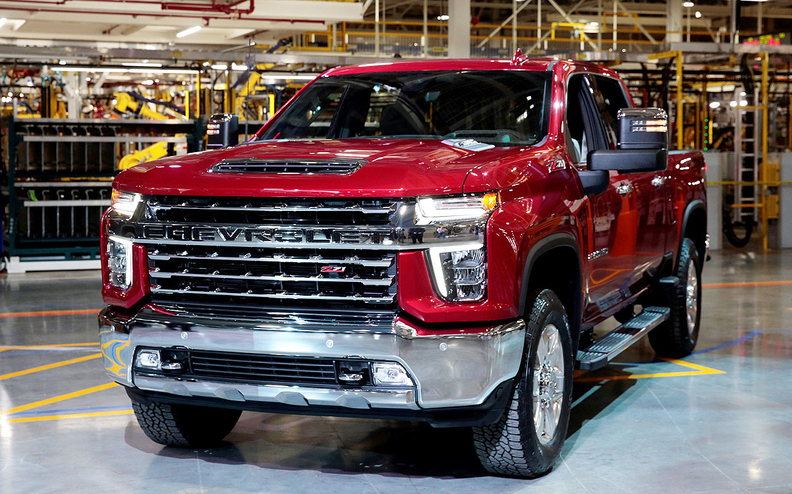 GM on Tuesday confirmed it would be adding 1,000 employees at its truck facility in Flint to support production of the redesigned Silverado HD and Sierra HD, which are expected to go into production in June. The optional engine is in addition to Ford already offering a 6.7-liter Power Stroke diesel and a standard 6.2-liter V-8. The 2020 Silverado HD, according to GM, is 10.4 inches longer than the outgoing truck, 1.4 inches wider and 1.6 inches taller. Its wheelbase also is 5.2 inches longer.